Filed under: Books, Geology / Earth Science on January 28th, 2019 | Comments Off on Free 53-Page Rock & Mineral Fun Book! 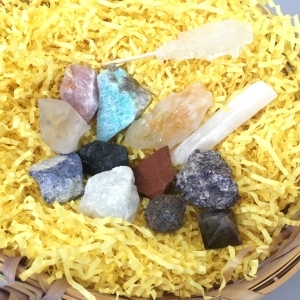 Liven up this holiday season by filling those Easter baskets with 12 great mineral samples. In 2019, Easter and Earth Day are April 21st and 22nd. We created a group of 12 pretty and popular minerals samples that are sure to delight every kid in your life. 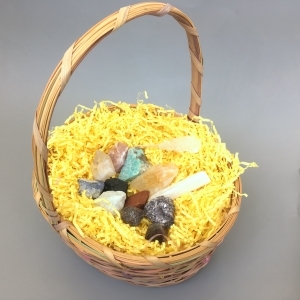 Plus, becuase we know how great Easter candy can be, each set of minerals also comes with a Rock Candy Lollipop! Get your mineral bundle today! March 14th is everyone’s favorite Math Day – Pi Day! 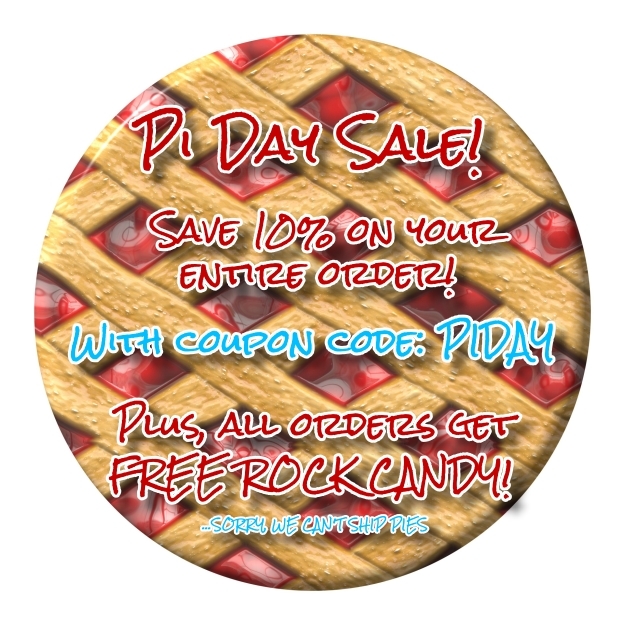 Plus, every order will receive a free ROCK CANDY LOLLIPOP! Sorry, we can’t ship actual pies. Shop now at www.MiniMeGeology.com. The coupon code is valid through March 17, 2019. Filed under: Announcements on March 13th, 2019 | Comments Off on Happy Pi Day! Is your little one having a birthday? Do they love rocks and minerals? Then throw them a Rock Detectives Geology Birthday Party! This party idea is based on Mini Me Geology’s Rock Detectives line of kits to give your child and their guests hours of fun. 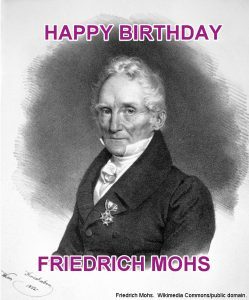 Below you will find a Rock Detectives Geology Birthday Party Plan with ideas that will help you design a party full of rock and mineral identification activities, geode cracking, panning for minerals and storage box creation. Throwing a party is simple, choose the Rock Detectives kits that you want to use as the theme for the party such as minerals, crystals, rocks or all of them. Your kids can learn about Metamorphic Mysteries, become a Sedimentary Sleuth or solve an Igneous Investigation. You can also design your party around our Crystal Geometry and Crystal Experiments kits or go on a Mineral Mission. Our Rock Detectives Birthday Party Invitations and Activities eBook includes instructions for panning, geode cracking, storage box creation, and rock bingo as well as invitations to send to your guests! In addition to the activities in the party eBook, each Rock Detectives Kit comes with its own CD with an eBook full of activities, puzzles, and experiments that you can use at your party. Each party pack of Rock Detectives kits comes with a free parent copy of the Rock Detectives eBooks so that you can print and prepare the party activities from the kits before the kids arrive. Each kit has word puzzles, mazes and coloring pages that you can give to your party guests to occupy them as other guests arrive. A good geologist always has a way to carry their samples. Create fun storage boxes out of inexpensive items from around your house. Instructions are provided on the Rock Detectives Party eBook. You can use plastic boxes or egg cartons to make great boxes with individual slots for different samples. Print the sample identification and activity pages from the Rock Detectives eBook and let your party guests follow the clues to identify the name of each sample in their Rock Detectives kit. Each kit comes with a hand magnifier to help see the details! We recommend that you use one Rock Detectives kit for every two to three kids at the party so they each have samples to identify and test. Mini Me Geology’s new Earth’s Treasures Geology Sifting Cups are a fun party activity and great take-home gift. 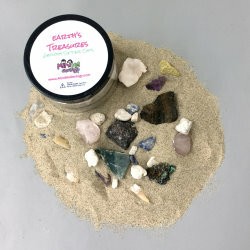 Each 8-ounce jar is filled with natural beach sand, rocks, minerals, and fossils. No two jars are exactly the same so each child has a unique set of samples. To find your hidden treasures, simply pour the contents through a beach sifter as real geologists do. The sand will fall through leaving your goodies behind. If you don’t have a beach sifter on hand have the kids create their own by layering several layers of aluminum foil then rolling the ends together to make a bowl. Using the sharp tip of a pencil, poke small holes in the foil to create a homemade sifter that will allow the sand to fall through and keep the treasures on the foil. If you prefer to make your own sifting gifts, use a small bucket or mason jar and fill it with a mixture of sand, rocks, minerals, and fossils. Instructions are provided on the Rock Detectives Party eBook. We have bulk rocks and minerals and fossil shark teeth for your panning buckets. All good geologists break open rocks to see the inside. Kids love to crack open large geodes to see the crystals inside. 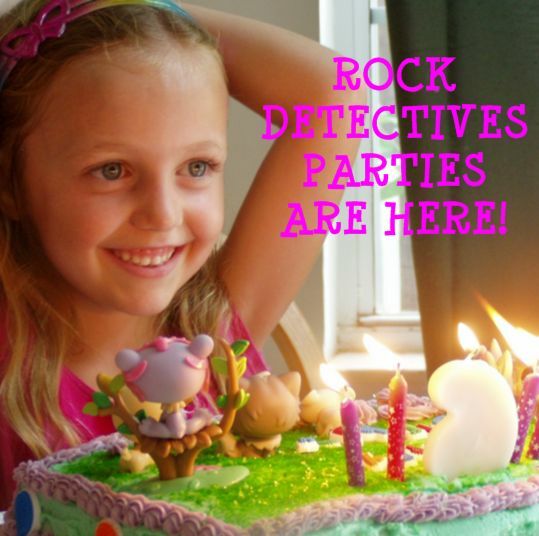 Instructions and safety precautions are provided on the Rock Detectives Party eBook. Our large geodes make great take-home gifts for your party guests. All good geologists love experimenting on their samples. Each Rock Detectives kit includes instructions for experiments that you can do during the party like growing sugar and salt crystals, creating metamorphic rock cookies and much more. Don’t worry if you run out of time, you can print the instructions and let the guests take them home. Activity #7: Wrap Up with Rock Bingo! Play Mini Me Geology’s Rock Bingo to wrap up your party. The bingo game is included on the Rock Detectives Party Invitations and Activity eBook. A great gift for winners is rock candy from your local candy store. If you can’t find the candy locally, give us a shout and we can point you to some online sources for bulk rock candy. Get started planning your party today! If you have questions about our kits or how to throw a successful party, contact us. 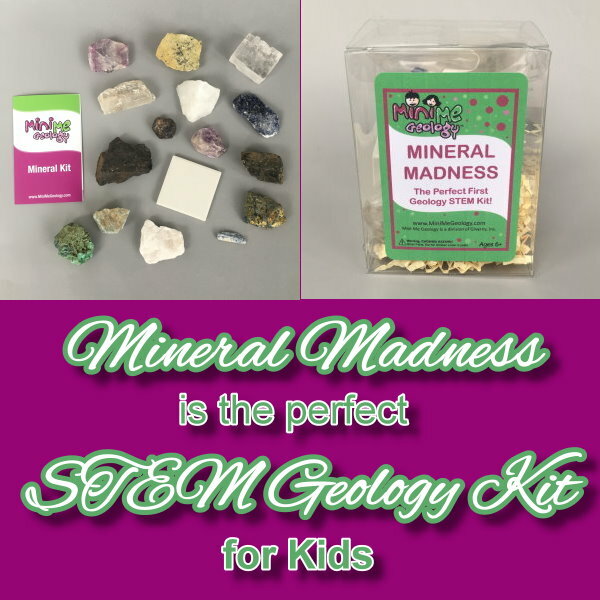 Mini Me Geology’s Deluxe My Rockin’ Collection series rock and minerals kits are the perfect STEM geology fun for children and adults. Mini Me Geology’s series of rock and mineral kits are the perfect collection for kids, teens, and collectors who love geology. You will enjoy these kits that feature large mineral and rock samples, identification accessories, sample information, and sturdy storage boxes. The Mini Me Geology deluxe kits are perfect for classrooms and homeschool STEM geology lessons too. 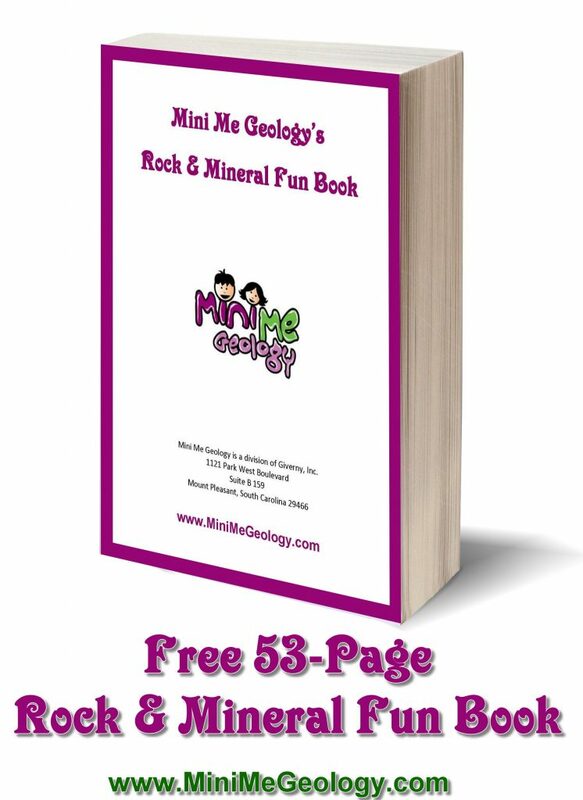 Kids will have hours of fun with the My Rockin’ Collection Series Kits, Mini Me Geology’s Deluxe Rock and Mineral Kits. You’ll get 10 or 15 large rock or mineral samples, a hand magnifier, and a set of identification cards. The mineral kit also comes with white and black streak plates. Each kit comes in a sturdy plastic box, with snug latches that keep the box closed and everything in its place. Each identification card includes a photo and information about the physical properties of the rocks and minerals. This information will help identify your sample. Then, look under the green foam to find out if you’re right. 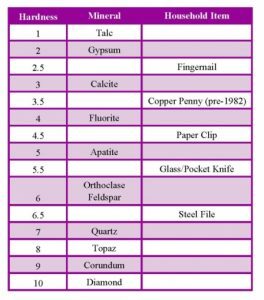 After naming all your rocks or minerals, there’s more information on the identification cards about each sample, like where the sample can be found, unique features, and common uses. If you’re looking for more information about your My Rockin’ Collection Kit, check out the Dig Into Geology section at minimegeology.com, to learn how to perform a proper streak test, how to focus your hand magnifier, how to use household items to test the hardness of your minerals, and how to determine rock textures. You can print out an identification flowchart, it’s a fun and easy way to identify your samples. Mini Me Geology Rock Detectives Kits for Elementary and Middle School STEM activity fun! The Rock Detectives Kits are absolutely perfect for kids who are starting out in science. These kits are great for STEM activities and they can help kids who are resistant to science become more interested through the experiments, activities, puzzles and coloring pages. This video gives you a little more insight into these fun kits that we developed just for kids! Kids will have hours of fun with the Mini Me Geology Rock Detectives Kits. These fun kits come complete with six or seven cool rock or mineral samples, a hand magnifier and a mini CD with 30 pages of mineral information, sample identification activities, puzzles, coloring pages and experiments. Other fun activities on the CD include creating your own adventure story, making a personal geologist field notebook and your very own rock collection box. No CD tray? No problem! Each pdf eBook is downloadable, too. Our Rock Detectives kits are best for ages 6 through 12. If you’re looking for more information about geology, check out the Dig Into Geology section at minimegeology.com. Filed under: Geology / Earth Science, Geology Experiments & Activities, Minerals, Rocks on October 31st, 2018 | Comments Off on Mini Me Geology Rock Detectives Kits for Elementary and Middle School STEM activity fun! Ask-a-Geologist Your Questions about Rocks, Minerals, Fossils! Stay in touch with all of the latest from Mini Me Geology by joining our newsletter! Filed under: Geology / Earth Science on October 18th, 2018 | Comments Off on Ask-a-Geologist Your Questions about Rocks, Minerals, Fossils! At Mini Me Geology we have a great selection of geology products that are perfect for all of your STEM lessons. This fun rock and mineral poster set has four posters for Minerals, Igneous Rock, Sedimentary Rocks, and Metamorphic Rocks. You can find these on our website. These are the same flyers included in our Junior kits and our Colossal Rock and Mineral Kits and are perfect if you have a rock collection or if you are looking for an inexpensive way to introduce rocks and minerals as a hobby to your children or in school for earth science lessons. Each flyer features 10 of the most common samples found in natures. Flyers include minerals, igneous rocks, metamorphic rocks and sedimentary rocks.